Click here for audio of Episode 1926. Today, guest scientist Andrew Boyd persuades us. The University of Houston presents this series about the machines that make our civilization run, and the people whose ingenuity created them. Every day we're faced with people who want to persuade us: salesmen want our money, politicians want our vote, and our children want to stay up past their appointed bedtime. We put up with it because, well, it's just part of life. But, to the ancient Greeks, persuasion was more than a nuisance. It was a highly respected skill, something to be studied and perfected. The term used by the Greeks was rhetoric, which today not only refers to persuasive communication, but communication that is overly complex or pretentious. To the Greeks, however, rhetoric meant persuasion, without those negative overtones. Greek education began with the study of grammar, logic, and rhetoric. These three subjects were considered so important they even had their own name - the trivium, which means "the three roads." While grammar and logic seem reasonable choices for the foundation of education, how did rhetoric wind up in the mix? Rhetoric was popularized in the fifth century B.C. by the sophists. The sophists began as a respected group of educators paid to teach rhetoric as a practical skill, useful in a democratic society. But as sophist rhetoric evolved, it became more and more focused on winning an argument to the exclusion of all else. Today, we use the word sophistry to describe an argument that sounds good but is mis-leading or downright false. Sophist rhetoric was attacked by Plato, who believed in arguments based on logic. To Plato, logical arguments led to truth, a far nobler goal than simply winning an argument. But it was Plato's greatest student, Aristotle, who would fashion a respectable vision of rhetoric that would dominate western thinking for the next two thousand years. 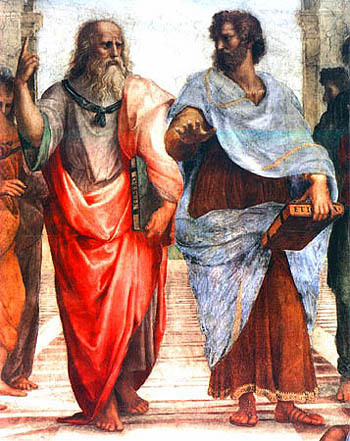 Like Plato, Aristotle firmly believed that logic was absolutely essential when constructing an argument. But he went further, emphasizing things like appealing to the emotion of listeners, good presentation skills, timing, and how the mood of an audience influences what they hear. Where Aristotle differentiated himself from the sophists was in his focus on the process of creating a persuasive argument rather than on winning at all costs. Aristotle brilliantly clarifies his position in the very first sentence of his book, The Art of Rhetoric, where he refers to rhetoric as the counterpart to Plato's logic. Logic is required to find truth, but rhetoric is necessary to communicate truth. Here we see why rhetoric is viewed as so essential to Greek education. Persuasive communication isn't an unpleasant afterthought, it's a vital part of bringing ingenious ideas to life. For those of us accustomed to letting the facts to speak for themselves -- especially scientists and engineers -- perhaps there is a lesson to be learned from the Greek emphasis on rhetoric: So much of what we hear today should not be called rhetoric. Communication and truth must be made to go hand in hand. It is in this sense that communication is as important as the message we carry. I'm Andy Boyd, at the University of Houston, where we're interested in the way inventive minds work. An updated version of this episode can be found at 3051. Dr. Andrew Boyd is Chief Scientist and Senior Vice President at PROS, a pricing and revenue optimization software firm. Dr. Boyd received his A.B. with Honors at Oberlin College with majors in Mathematics and Economics in 1981, and his Ph.D. in Operations Research from MIT in 1987. Prior to joining PROS, he enjoyed a successful ten year career as a university professor. We use the word logic to avoid discussing dialectic in the limited time available.